At a special faculty meeting Nov. 29, a motion was passed to delay votes on the proposed changes to the General Institute Requirements that were presented in the report from the Task Force on the Undergraduate Educational Commons released earlier this year. No votes will occur until at least Feb. 2007. 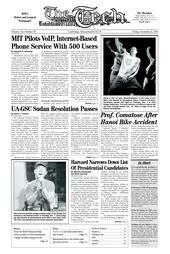 The review of the MLK program is available at https://web.mit.edu/provost/mitdocs/MLK_Report_May2006.pdf. The report discusses the Martin Luther King Visiting Professor and Scholar Program and emphasizes the importance of developing an Institute-wide strategy for the recruitment of minority faculty at MIT. The PE lottery for IAP opened this week and will close Wednesday, Dec. 13. IAP PE classes begin Jan. 8 and end Jan. 29. Students can enter the lottery at http://web.mit.edu/athletics/www/physed/index.html. Buffets are now offered at Pritchett Hall Dining on Tuesday nights and at McCormick Hall Dining on Thursday nights. Preferred dining is accepted at both locations. MacGregor’s pilot dining program offering Tuesday buffets ended this week.